It is officially cold in my book today. We’ve gone below the temperature at which I switch from shorts to long pants. I hadn’t posted a weather widget in awhile so the time seemed right. 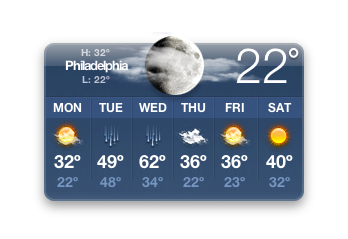 For those of you that don’t understand the idea of thermal underwear — come to Philly today for a visit. This entry was posted in talking and tagged temperature, this fair city, weather, widget, winter. Bookmark the permalink.